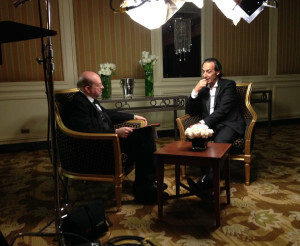 It’s always an honor to spend time with the legendary John Williams. 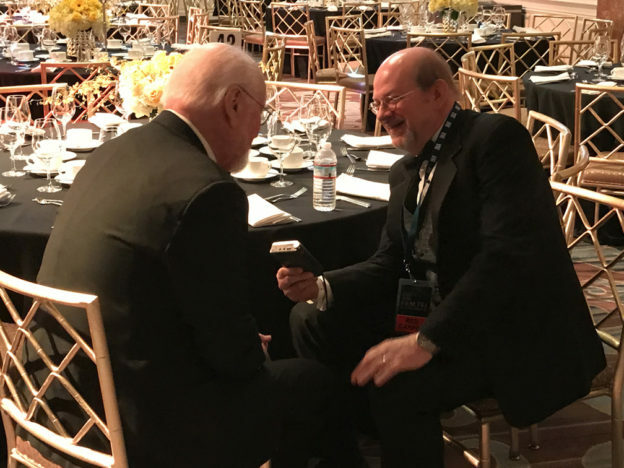 I had a few moments with the maestro before he received BMI’s latest honor, named after him, and added a few tidbits about his current schedule in the Variety story I wrote the next morning. He was especially excited about the piece he’s written for cello and harp to celebrate the Leonard Bernstein centennial later this year at his beloved Tanglewood. This entry was posted in and tagged Bernstein Centennial, BMI, John Williams, John Williams Exclusive, Tanglewood, Variety on May 10, 2018 by Jon Burlingame. Composer John Williams has won practically every award possible in his long and distinguished career — Oscars, Emmys, Grammys, even the Kennedy Center Honor and the American Film Institute’s Life Achievement Award. So Broadcast Music Inc. (BMI), one of the nation’s leading performing-rights societies — which had already given him its top honor in 1999 — gave him an even higher honor by naming a new award after him. It was a particularly star-studded evening, as I tried to convey in this Variety story about the society’s annual Film, TV and Visual Media Awards in Beverly Hills. This entry was posted in Composers, Film Music, Interviews, Television Music and tagged BMI, Film TV and Visual Media Awards, John Williams, John Williams Award, Variety on May 10, 2018 by Jon Burlingame. 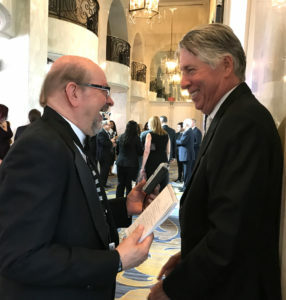 Oscar-nominated, Grammy- and Emmy-winning composer Alan Silvestri received BMI’s Icon Award Wednesday night at the Beverly Wilshire Hotel. His was the top honor among dozens distributed by the performing-rights society. The evening was a who’s-who of composers, songwriters and music supervisors active in films and TV. Variety asked me to cover the event, so I managed to sneak in a little time with the composer of Back to the Future, Forrest Gump, Cast Away, TV’s Cosmos and so much more. Among others in attendance: Tyler Bates (Guardians of the Galaxy), Brian Tyler (Fate of the Furious), the legendary Mike Post (Law & Order), W.G. Snuffy Walden (The West Wing) and many others. Excerpts from my red-carpet interviews are included in this video. This entry was posted in Composers, Film Music, Interviews, Television Music and tagged Alan Silvestri, Back to the Future, BMI, BMI Icon, Brian Tyler, Cast Away, Cosmos, Forrest Gump, Mike Post, Tyler Bates, Variety, W.G. Snuffy Walden on May 12, 2017 by Jon Burlingame. Composer James Newton Howard (The Sixth Sense, The Hunger Games, pictured here) was honored with the BMI Icon award at Wednesday night’s annual film/TV honors of Broadcast Music Inc. (BMI), while David Newman received its Classic Contribution Award for his work conducting classic film music in concert halls around the world. I was on the red carpet again this year, conducting no fewer than 25 on-camera interviews with composers for film and TV. BMI is posting them on YouTube; here is Howard, here is Newman. And here is my story about the evening. This entry was posted in and tagged BMI, BMI Icon award, Classic Contribution award, David Newman, film music in the concert hall, Film Music Society, James Newton Howard on May 13, 2016 by Jon Burlingame. 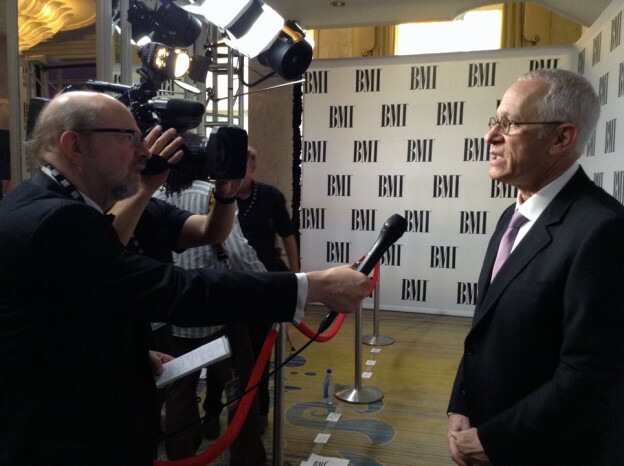 It was a thrill to be asked to talk with Oscar-nominated, Grammy-winning composer James Newton Howard on the occasion of his being named a BMI Icon. 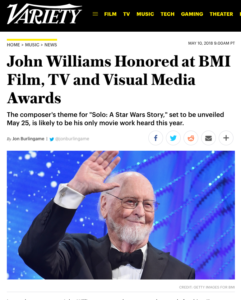 He’ll receive his award on May 11, but BMI has already posted our video interview: Fourteen fascinating minutes with one of today’s greatest movie composers. (His credits, in case you don’t know, include The Hunger Games films, The Sixth Sense, The Fugitive, The Prince of Tides, King Kong, My Best Friend’s Wedding and many others.) Both parts of the interview are here. This entry was posted in and tagged BMI, BMI Icon, James Newton Howard, King Kong, The Hunger Games, The Sixth Sense on April 12, 2016 by Jon Burlingame. 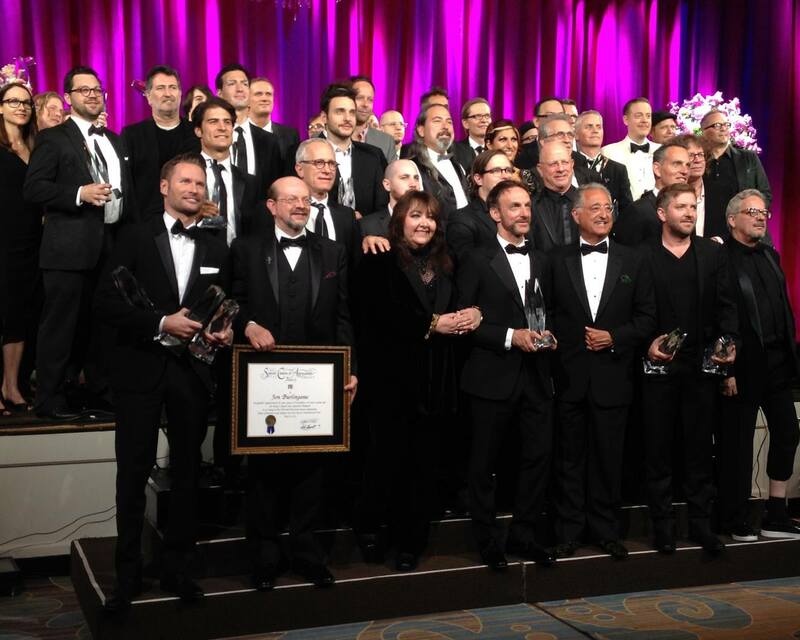 Alexandre Desplat and Chris Montan (the Oscar-winning composer of The Grand Budapest Hotel and president of music for the Walt Disney Company, respectively) took top honors at this year’s BMI Film and TV Music Awards dinner. Here is my overview of the evening’s speeches and additional awards. Part of the fun, though, was doing the on-camera interviews on the red carpet — some of which are now showing up online. This link will take you to my brief chats with Desplat, Montan, Brian Tyler (talking about doing Marvel movies), Fil Eisler (Revenge) and Gwendolyn Sanford (Orange Is the New Black). This entry was posted in Composers, Film Music, Interviews, Television Music and tagged Alexandre Desplat, BMI, Brian Tyler, Chris Montan, Fil Eisler, Film and TV Music Awards, Film Music Society, Gwendolyn Sanford on May 15, 2015 by Jon Burlingame. 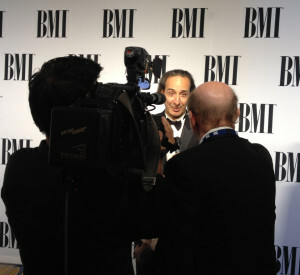 On May 13, I interviewed Oscar-winning composer Alexandre Desplat for BMI, just hours before the performing-rights society presented him with its Icon Award for career achievement. I have interviewed Desplat many times over the years, but he was especially forthcoming and (as always) charming in this setting. Here he talks about how he got into the business, how he approaches each new film, working with Wes Anderson (for whose film The Grand Budapest Hotel he won the Oscar) and advice for young composers. While you’re at that page, click on the other videos; I did all of BMI’s red-carpet interviews and there is some really fun stuff there. This entry was posted in and tagged Alexandre Desplat, BMI, Grand Budapest Hotel, Icon Award, Wes Anderson on May 14, 2015 by Jon Burlingame. This was after a three-minute video — a complete surprise to me — that featured composers Christopher Lennertz, Mike Post, Charles Fox, Richard Sherman, Lalo Schifrin, David Newman and John Williams, thanking and congratulating me. It was truly moving. I will never forget the standing ovation that followed. (Or Williams saying, “May your pen continue to flourish and may your inkwell never dry up.”) And I can never thank Doreen and her fellow executives at BMI enough for this huge honor. I got to stand with the rest of the BMI honorees including the wonderful Mychael Danna, who received the evening’s highest honor, the Richard Kirk Award. A couple of hours earlier I did a long video interview with Danna; here he talks about his journey from small independent films to big studio features; here he talks about Ang Lee and his Oscar-winning work on Life of Pi; and here he discusses his creative process. And for the first time, Variety actually wrote about me rather than just publishing my own work! This entry was posted in and tagged BMI, BMI award, BMI honors, Doreen Ringer Ross, Mychael Danna, Richard Kirk Award, Variety on May 15, 2014 by Jon Burlingame. BMI asked me to write a piece acknowledging the celebrated film composer’s 80th birthday. Here it is. I drew on interviews that I had done over the previous months, for Classical KUSC and Variety, for some of the quotes. This entry was posted in Composers, Film Music, From the Files, Interviews and tagged Adventures of Tintin, BMI, Boston Pops, Classical KUSC, Jaws, John Williams, Lincoln, Steven Spielberg, War Horse on May 18, 2012 by Jon Burlingame. Rolfe Kent, the delightful English composer of Sideways, About Schmidt and Dexter, received BMI’s top award in 2012. Instead of the usual career profile, BMI asked me to pose 10 questions that might elicit some offbeat answers. (They did.) Also, here’s a story about the ceremony itself. This entry was posted in Composers, Film Music, From the Files, Interviews and tagged About Schmidt, BMI, Dexter, Richard Kirk Award, Rolfe Kent, Up in the Air on May 14, 2012 by Jon Burlingame.